This question appeared as a part of the quantitative reasoning and data interpretation section of the XAT 2015. Question 8 of a total of 33 questions that appeared in this section in XAT 2015. This one is an easy aptitude / quant question that tests concepts about quadratic equations and the curves that these equations represent. Find the equation of the graph shown below. In the graph, x and y-axes have been swapped from the conventional ones. i.e,. horizontal axis has been named y-axis and the vertical axis has been named x-axis. The curve is a parabola. However, in our case, the x and y axes have been swapped. Substitute x = 0 in the choices that match the form of equation stated in the key inference step and see which one matches the data. Cross check with another value when y = 0. The choice that matches both conditions is the answer. The equation has to be of the form x = ay2 + by + c.
A quick look at the choices tells us that we can eliminate choices A, B, and D.
Choice A is a linear equation. So, it represents a straight line. Rule it out. Choices B and D are of the form y = ax2. Our axes are swapped. So, choice B can also be ruled out. Substitute y = -4 in the equation. We get x = 2(-4)2 – 40 = 32 – 40 = -8. However, we know that when y = -4, x = 0. So, Choice C cannot be the answer. When y = -4, x = 2(-4)2 +3(-4) – 19 = 32 – 31 = 1. So, when y is around -4, it will be 0. Let us validate it with one more data point. When y = 0, x = 2(0)2 + 3(0) – 19 = -19. 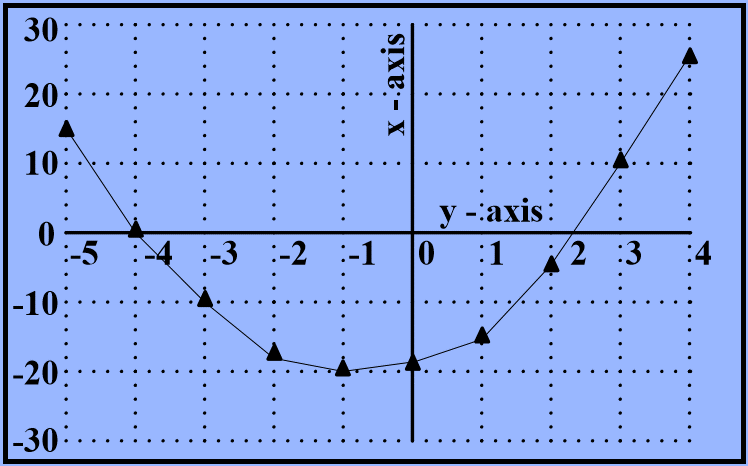 The value of x is around -20 as indicated in the curve.